Ford’s new hot hatch version of the Focus will be priced from a competitive £21,995 when it goes on sale on June 1. It undercuts the price of rivals such as the Golf GTI, and will be offered in both hatchback and estate forms. All models are powered by a 2.0-litre direct injection EcoBoost turbocharged engine, with a power output of 250PS, fuel economy of 39.2mpg and emissions of 169g/km. The chassis and steering have all been tuned to improve handling. The ST comes with a striking body kit, featuring a central exhaust, trapezoidal front grille and large alloy wheels. If buyers really want to stand out, Tangerine Scream orange paint is offered as an option. Three trim levels are offered – ST, ST-2 and ST-3. The ST comes with 18 inch alloy wheels, cloth trimmed Recaro seats, manual air-con, keyless start, DAB radio, Bluetooth and USB connectivity. ST-2 models get partial leather trim, an improved audio system, rain sensitive wipers, auto headlights and a Quickclear screen. Top models benefit from full leather trim, heated front seats, bi-xenon headlights, LED running lights, keyless entry and power folding mirrors. 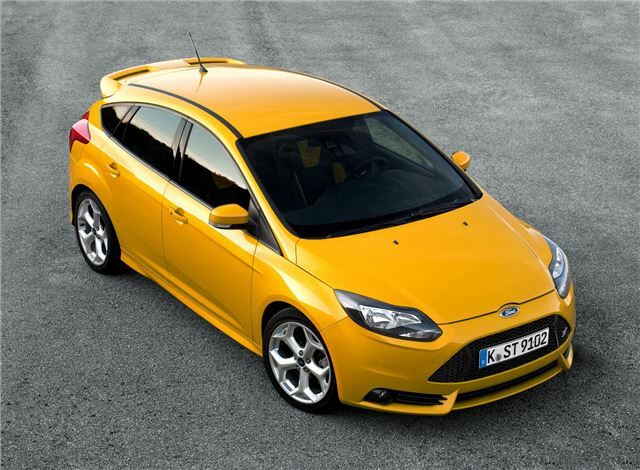 The Focus ST hatchback is priced from £21,995 and the estate from £23,095. Order books open June 1, with first deliveries due in September.